The avalanche-to-streamer transition is studied and illustrated in a particle model. The results are similar to those of fluid models. However, when superparticles are introduced, numerical artifacts become visible. This underscores the need of models that are hybrid in space. Li, C, Ebert, U. M, & Brok, W.J.M. (2008). Avalanche to streamer transition in particle simulations. 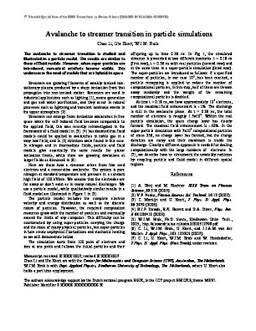 IEEE Transactions on Plasma Science, 36(4), 910–911.